Published by US Games Systems Inc. 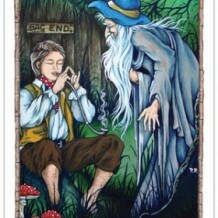 This Tarot deck provides a parallel between the amazing storyline of Oxford professor JRR Tolkein’s novel ‘The Hobbit’ and the experiences we have in our own life, and it seeks to provide caution and wisdom in order to help us achieve our aims. 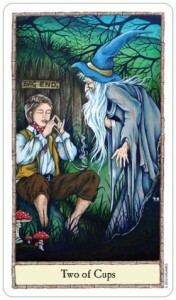 The booklet offers interpretations of each of the 78 cards and includes a 12-card ‘The Ring of Gollum’ spread, a 9-card ‘The Sword of Aragon’ spread and a 14-card ‘The Arkenstone’ spread, the latter unfolding as a spiral to be read in story-telling fashion, from the centre outwards. UK-based Peter Pracownik is at the forefront of visionary genre artwork and has produced 78 inspired, creative artworks for this deck. He was also commissioned by US Games Systems Inc. to produce the artwork for the ‘Dragon Tarot’, the Wyvern Collectible card game, ‘The Lord of the Rings Tarot’, the ‘Imperial Dragon Oracle Deck’ and the ‘Woodland Wisdom Oracle Cards’. He has held successful exhibitions in Hollywood and has made appearances on TV in the UK and US. 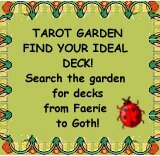 London based Terry Donaldson is a professional Tarot reader, guide and healer, and the author of several books on Tarot, magic and folklore. He travels extensively and has studied in Greece, Iran and India. He previously collaborated with the artist, Peter Pracownik on ‘The Dragon Tarot’ and ‘The Lord of the Rings Tarot’. 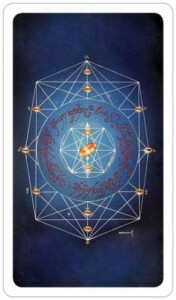 The card backs are imperceptibly irreversible and provide a Kabbalistic-style geometric web design with a golden ring to represent each of the sephiroth. I was pleased to see this glyph, as we are reminded that within the chaos and violence of this story, morality and spiritual values play a vital part. I found that the deck and the storyline have a staunch masculinity, similar to the myths of the Anglo Saxons which originally inspired the novelist. 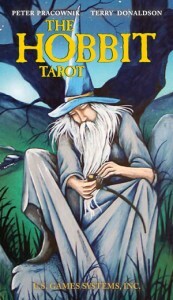 The Four of Cups features Gandalf (also chosen for the front of the packet) shown with his tall conical hat and his long grey beard. He is sitting and filling his pipe under a tree by a pool in the gloaming. He is reflecting on his next move. Throughout the story, Gandalf disappears but returns when he is most needed by the Companions. Divinatory Meaning: Reach out for new friendships, withdrawing from others, feelings of dejection. This card tells you that things are being taken too personally and apathy is taking place. You are becoming stuck, unable to see new opportunities that are presenting themselves. It is time to take down defences and have greater trust in the goodness of others. Reversed, it can show that you might need to spend more time in meditation or personal reflection, separating yourself from others in order to regain your centre of gravity. The Three of Coins shows three trolls, one holding a large sack. Poisonous toadstools grow in the foreground. The monsters have captured the Companions and are preparing to eat them. But Bilbo thinks quickly and plays for time, and this aids their eventual escape. Divinatory Meaning: Learning new skills and abilities, professional growth, establishing oneself, and becoming more aware of one’s abilities. The card also pertains to team activities and good organisation. It is not possible to create anything without support and co-operation. 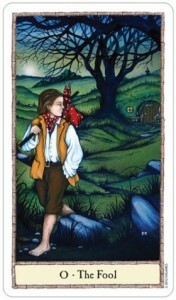 The presence of the card in a reading portrays the discovery of a new passion. Reversed, it indicates an inability to see the wood for the trees, or being overly attentive to details or rules, or too critical, absorbed, or failing to read the right signals. It can also question present knowledge and whether it is up to date.